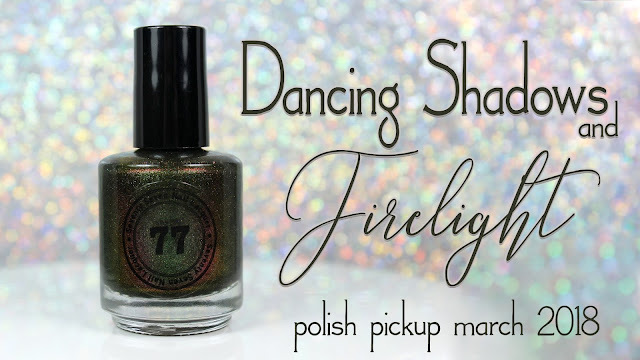 It has been too long since I have had some 77 Nail Lacquer on the blog, and I am glad it ended up being this glorious Polish Pickup offering. It is kinda goth, kinda glam...and allll good. This is a stunningly glowing olive green shade with green glowing flakes and a healthy dusting of holo. As if that isn't enough, these green flakes have a firey rusted shift that really sets this apart from your average dark green. This shade is sophisticated enough that I think its fairly office appropriate, but it still has a little edge. The formula is pretty good, too. For all but my index finger, I used three coats. I found those three fingers to be slightly thick, and I was a little worried. Polishes like this need to be just so otherwise you don't get the full effect of the flakes. After finishing the first fingers, I shook the hell out of this polish and held it in my hand while I set up my camera for the video (below). I think shaking + warming really helped, because my index finger only has two coats and the formula was a lot better. It probably has something to do with the fact that it was 62F inside my house...so yeah. Maybe not keep your house so frosty. For the sake of your polish. I hit it with my flash, and it came alive like christmas lights. Annnnnnnnnnd, you guys, I finally got a tripod strong enough and balanced enough to support my real camera. My videos have improved 700x. Don't believe me? Just watch below! The Polish Pickup opens tomorrow. TOMORROW. I am not prepared. I still need to finalize my wishlist. Have you finished yours yet? What is your limit? Love the color change you captured in the angles. And that flash photo!! WOW! I have a color very similar to this that I have yet to try! But I love the different flecks of color this polish has. That last photo is so neat! Love that green shift! Oooh I love the green and how it shifts with the angle! Wow, this is pretty and very shifty. She totally crushed it this month! The shift is phenomenal.Yay to new tripod! Wow! That is one gorgeous shifter! This is a very unique polish! Great to hear that it wasn't thick after all, just needed some love. That's such a cool polish! I don't think I have one like it. Dang, that is a cool polish!! I love that shift! Wow, that is soo pretty! She totally nailed the inspiration! But is that a real book full of spells??! That shift made me need a cold shower. This is really nice & your photos look beautiful. You’ve described the polish perfectly too! Oh geez, this is so gorgeous. Look at that shift!